Life is Short, and Food is a Lovely Part of It: Six Courses at the Chef’s Table – Travel. Garden. Eat. Life is short, and food is a lovely part of it. As Julia Child is noted to have said, ““The only time to eat diet food is while you’re waiting for the steak to cook.” (However, I really must notch up the running again next week . . . ). 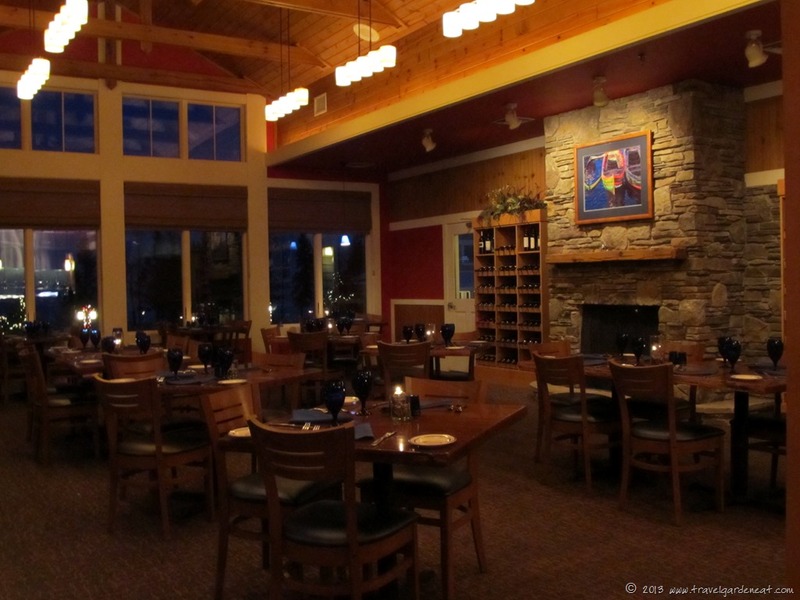 To celebrate our 22nd wedding anniversary, we decided to try the Chef’s Table dining experience at the Ledge Rock Grille, a cozy restaurant on the North Shore of Lake Superior, just south of the town of Two Harbors. The restaurant is located on the same property as the Larsmont Cottages. As the years go by, it is easy to treat one’s wedding anniversary quite casually, particularly when we are not the type that typically celebrate birthdays big, and have often found some home improvement project that needs completing rather than exchanging gifts to mark a special occasion. Life is busy at this stage of life, between work and family obligations. It makes it even more important sometimes to find that time to do something special to mark occasions which should be celebrated. Making reservations to enjoy the six-course menu at the “Chef’s Table” was definitely a way to mark a special occasion. 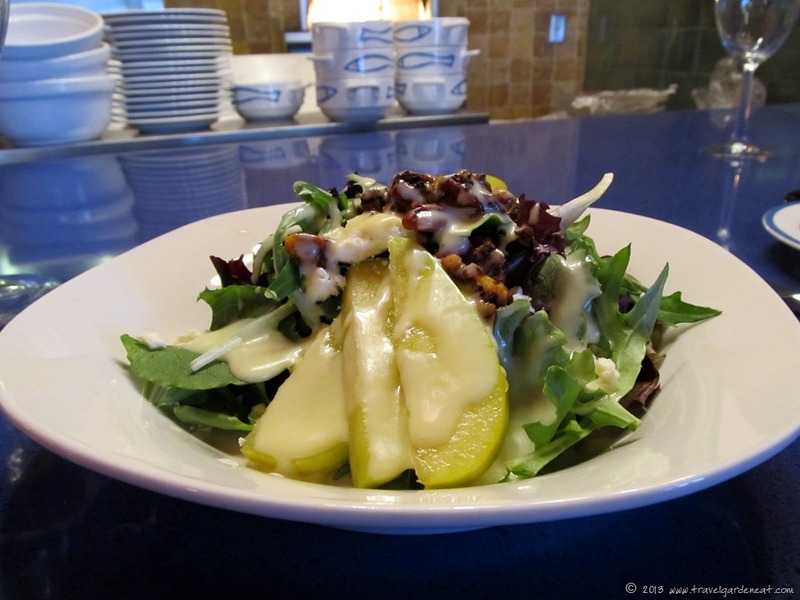 It promised to be a leisurely dining experience, which we chose to enjoy with wine pairings, on a quiet weeknight as spring kicked off its snowy start (unlike summer weekends when a reservation at the restaurant is sometimes impossible to obtain and the resort is full of guests). The Chef’s Table seats up to four guests at a counter-height spot adjacent to the open kitchen. On a night when the restaurant is quiet, it is as if you have your own personal chef and waiter, allowing for a relaxing evening, with the dinner courses paced over two hours. 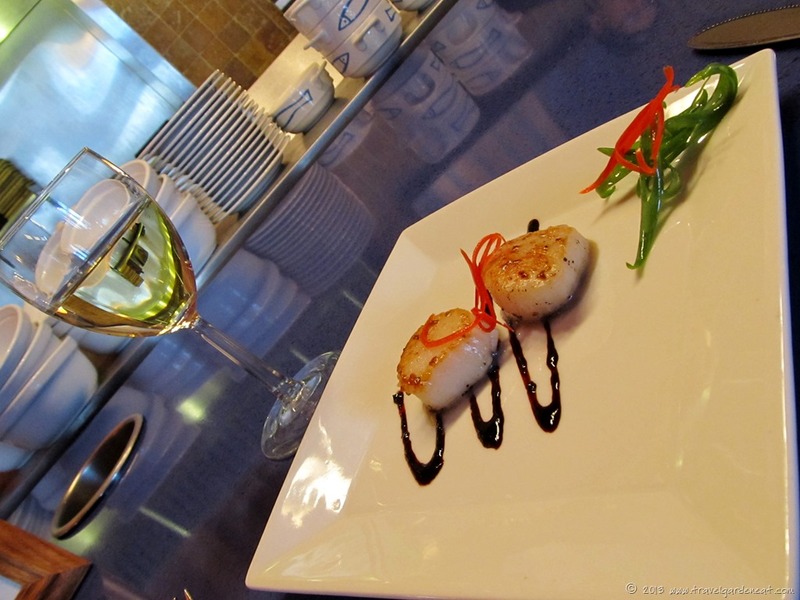 The first course featured one of my favorite foods — scallops! Blueberry balsamic was drizzled over the plate, serving as a cushion for the lightly broiled seafood bites. A Pinot Grigio nicely paired with this dish. 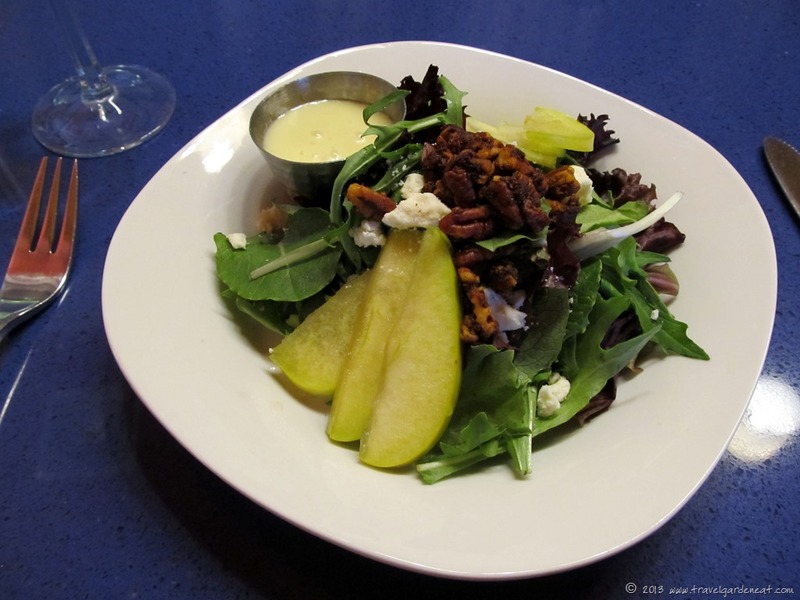 The salad course was a unique blend of flavors I had not expected — Arcadian spring greens, amaretto apples, feta, and candied spiced walnuts, with an apple cider vinaigrette. The apples had been soaked in amaretto and club soda, I believe. It resulted in a very light taste, with the amaretto acting almost as the second layer of flavor behind the apple, rather than overpowering it. The candied walnuts were spiced with many notes, including cumin, cayenne, and paprika. My husband, the real cook in our house, tried to dissect each layer of flavor and guess the different ingredients that created it. The slightly heavier Chardonnay was a great flavor partner for these layered tastes. 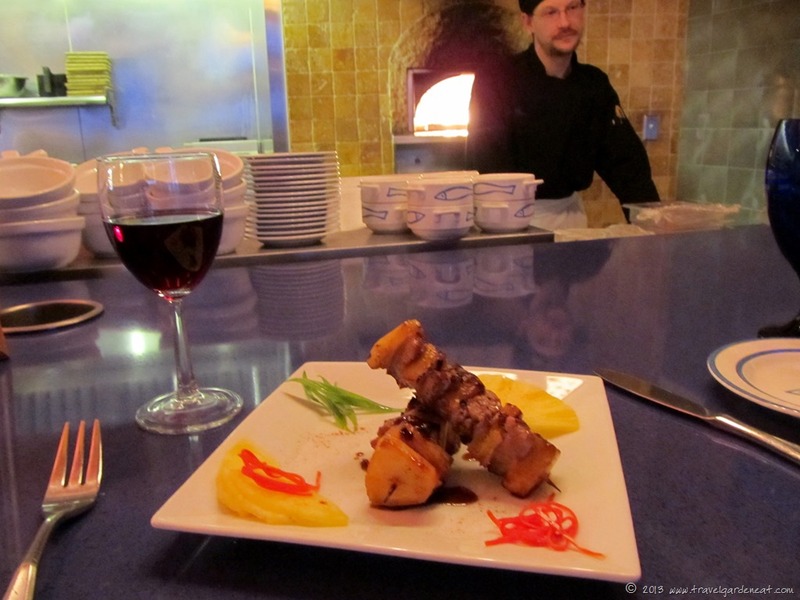 The Hawaiian Pork Kabob that “our” chef, Nate, prepared ended up being our favorite course. My husband already was scheming how to replicate it before he had a second bite. The teriyaki sauce did not overpower, but was a nice light glaze companion to the grilled pork tenderloin and pineapple pieces. A Pinot Noir was poured with this course. Nate kindly shared with my husband the general ingredients for the teriyaki glaze recipe and I look forward to my husband’s rendition of this tasty dish in the near future! The fourth course was an “intermezzo” course, meant for cleansing the palate. 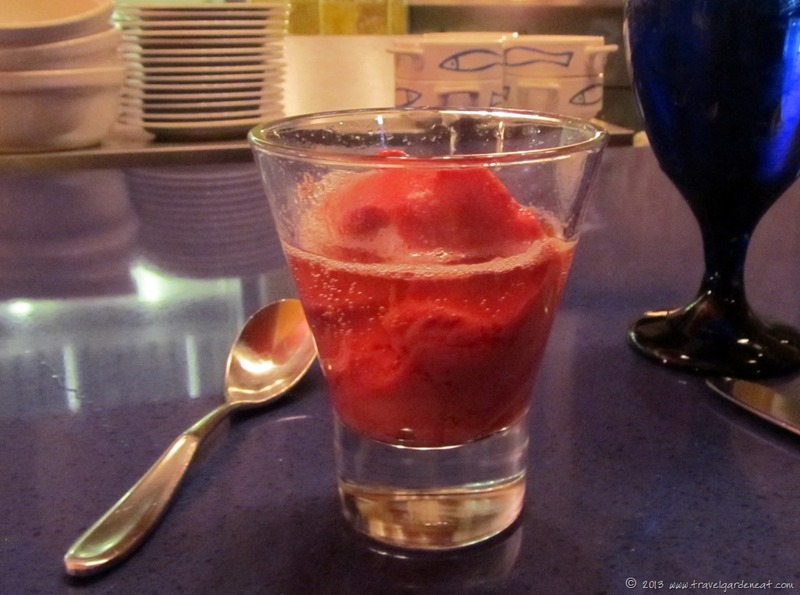 An intermezzo course often involves a sorbet, as it did at Ledge Rock’s Chef’s Table. But, instead of a side accompaniment of prosecco or champagne, the sorbet was served in a small glass of it — an elegant sorbet float! It was incredibly refreshing without being too filling before the main entrée. The next-to-last course is what most would call the “main” course or entrée. Our menu presented us with a Beef Medallion and Shrimp Skewer. Nate prepared the medallion perfectly, in accord with our tastes (medium-rare, more rare than medium). 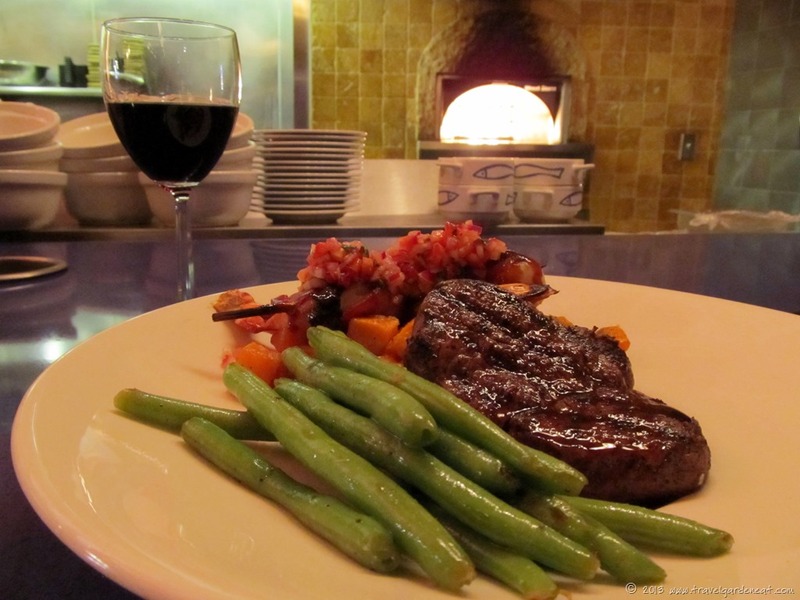 The beef was completed by a strawberry demi-glace which provided a nice hint of flavor for the tender cut of meat. The pairing of Cabernet wine was a natural choice. The two large shrimp were wrapped in applewood bacon on a skewer and then topped with strawberry chutney with accents of cilantro. Fresh green beans and a sweet potato side completed the colorful plate. Just roll me home now. But, wait there is still the sixth and final course. I have to admit that when I saw that the final course was a “S’mores Cake” I was thinking I might just have that course boxed up to bring home to my boys. Yes, having a “s’more” treat a couple times every summer when enjoying the campfire at the cabin is something I look forward to, but marshmallow and chocolate treats otherwise are not usually my thing. (I can do without those memories of marshmallow bunnies in the Easter basket.) 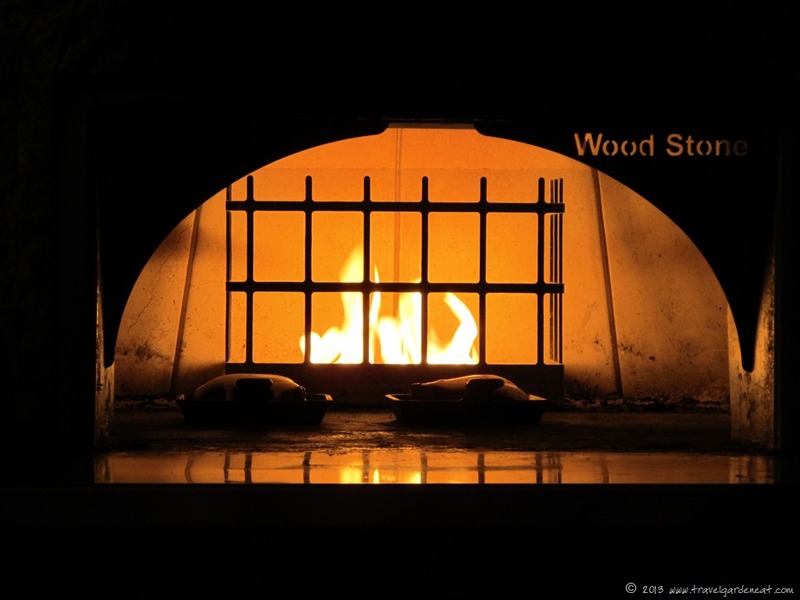 But, my opinion quickly changed as the marshmallow bubbled in the wood-fired oven and the chef drizzled chocolate over the top . 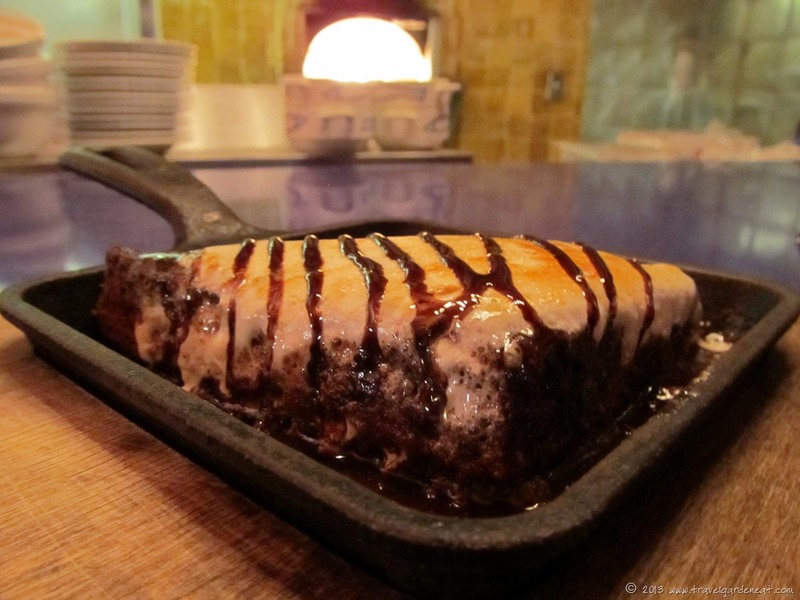 . .
How could I resist a Northwoods dessert served on a personal-sized cast iron plate? I should have, but I did not. It was as sweet and delicious as it appeared. A special treat for a special occasion. 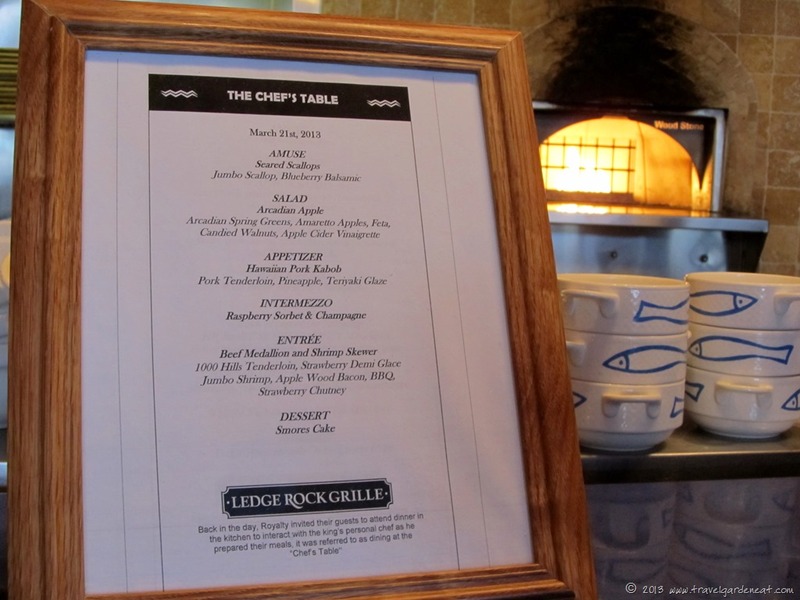 My husband and I decided perhaps we should use our anniversary as an excuse to reserve two seats at Ledge Rock’s Chef’s Table on a quiet weeknight in March each year. It gives us 364 other days of the year to work off the calories until the next six courses. Stunning food!! Almost makes me wish I ate meat. I smiled when I read that you dined at Two Harbors which is located “on the North Shore of Lake Superior.” My Uncle’s family immigrated to that area, eventually settling in Ft. Frances. A seat at the Chef’s Table is a wonderful idea for an anniversary dinner. The courses look delicious, so beautifully presented. What a great meal! Wishing you a belated happy anniversary. Thank you, John! We drove through Ft. Frances last summer on our way to Kenora. If you have never explored northern MN, many pretty spots. I’ve been up that way. My Uncle’s Sister and family live in Winnipeg and we’ve traveled there, heading up through Minnesota. That area on both sides of the border is really blessed. So beautiful. Looks amazing!! And congratulations to you guys! Tiny, thank you — it was a fun way to celebrate. What a lovely and enjoyably delicious way to celebrate your anniversary. May you have many one just like it. Thank you, Karen — it was a nice way to celebrate! Great eye, mind and taste visuals! Sounds like it was the perfect celebration…especially upon hearing John’s musings on flavors and how to use! Michael and I had a wonderful wandering conversation on the way to Iowa yesterday musing on what would each of our best list of meals over our past 20+ years be….went from best due to the comany to amazing places and flavors all the way from demolishing the Carniege Deli pastrami on rye sandwiches (if you can call a pound of pastrami a sandwich) in our New York City stay hotel room late at night…to the amazing white table cloth dining at Renoir in Las Vegas on our 10th Anniversary. We both decided what wonderful things meals/dinners/dinning or just at home can be and why not! Much happiness Kat and John! Cheryl, that is so true — it is not always the food that makes a dining experience a memory worth saving! Thank you, ideflex — it was a nice way to commemorate 22 years. I would love to combine it with a stay at those cute Larsmont Cottages next time! Oh YUM! We should head over your way for OUR anniversary! Definitely worth the drive, and a good opportunity to enjoy the scenery of the “other” Shore! It was a great evening. Thanks, Fergiemoto.